Before she was Konfident Miss Bling, she was Shavonne Owens from the Westside of Chicago, IL, known for being a woman of many talents, from designing clothes and accessories to organizing major events. Born into a musical family, her mother a pianist and her brother, a guitarist, it would only be natural for Shavonne to maintain a long lasting love affair with music. The radio was not only her source of entertainment, but served as a measure of success to be heard on her own show one day. In 2005 Miss Bling enrolled into Illinois Center for Broadcasting and received her diploma in Radio and Television. There she began to nurture her dreams of being a radio host and created her show Bling Radio introducing herself as Miss Bling. She adopted the name after her mentor told her that her personality blings. Miss Bling took her show to the internet where she pivoted herself and the show as an international outlet and was granted opportunities to interview mainstream celebrities and breakout talent. She has maintained her space on the internet since 2007. Though her show had a permanent home in Chicago, Illinois, Miss Bling herself crisscrossed the north and south and recently set up residence in Atlanta, GA. On her travels, she was granted major opportunities, including her new venture as a supporting reality TV cast member for TLC’s Family By The Ton. After her appearance on season 1 episode 4 she impressed the producers so much with her charismatic energy, they did not hesitate to bring her on the show to share her story for season 2. Miss Bling brings a new meaning to confidence within each episode as she encourages her family along their health journey and she transforms into a healthy lifestyle. Today, Konfident Miss Bling can be found on the second season of TLC’s Family By The Ton. 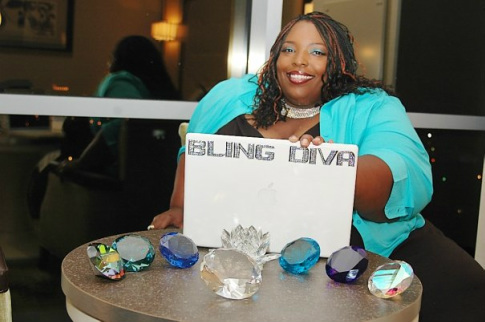 She maintains her staple career on the air waves of Bling Radio Show on Blog Talk Radio and continues to design Custom Apparel & Shoes which can be found on her website. Check out the BLING RADIO SHOW ARCHIVES BELOW!